NORWICH, CT- The Connecticut Tigers are proud to honor our military heroes once again this Veterans Day by offering a special "thank you" offer. For the fourth straight year, any current or former military member who comes to the Dodd Stadium box office on Friday, November 11, 2016 between 9 am and 5 pm will receive two complimentary ticket vouchers redeemable for a premium box seat to any 2017 regular season Connecticut Tigers game. The offer is only valid in person at the Dodd Stadium box office and some form of military identification must be shown. 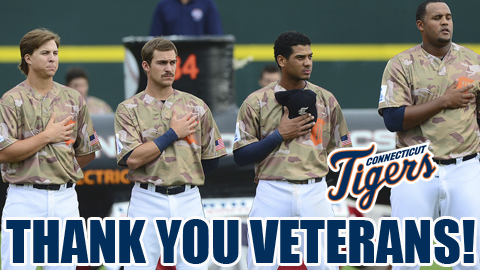 "Honoring those that serve our country has always been something very important to our organization," said CT Tigers General Manager Dave Schermerhorn. "Especially given the strong military community around us, we feel this is a small but important way to express our gratitude for everything these brave men and women have done and continue to do for us all. We hope they will enjoy a night at the ballpark next summer on us." The Connecticut Tigers are the New York-Penn League affiliate of the Detroit Tigers located at Dodd Stadium in Norwich, Connecticut. 2016 season tickets and team merchandise are now on sale! The front office and box office is open daily from 9 am to 5 pm Monday through Friday and can be accessed in person or by calling 860-887-7962.